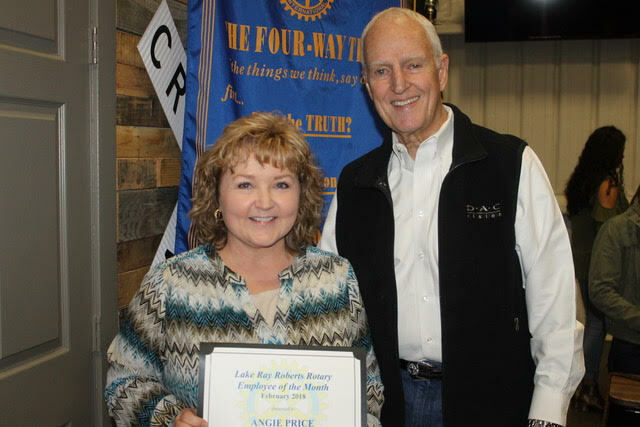 We were honored to have the Pilot Point ISD staff member of the month as our guest at our February 13th weekly meeting. We honor and recognize the teachers and staff at Pilot Point ISD. The teacher/staff members of the month are selected by the Pilot Point ISD. We support and appreciate the teachers and staff at all of our local schools. This months staff member of the month is Angie Price. Angie is the Administrative Assistant to the PPHS Principal, the Administrative Assitant to the Athletic Director and the Health Office Aide at Pilot Point High School.